1. Preheat the oven to 200°C, gas mark 6 and line a baking tray with parchment. 2. Combine the 2 sugars for the pavlova. Whisk the egg whites in a clean bowl until stiff, then add 1 tbsp of the sugars at a time whisking continuously, until smooth and glossy. 3. In a separate bowl, combine the vinegar, vanilla and cornflour then whisk this into the meringue. Spoon the mixture onto the parchment and spread out to make a circle roughly 22cm in diameter (see cook’s tip). 4. Place in the oven and reduce the heat to 150°C, gas mark 2. 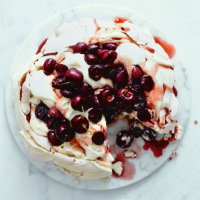 Bake for 1 hour 30 minutes until golden, then turn off the oven, open the door and leave the pavlova inside to cool completely. 5. Place the juice and sugar in a saucepan and gently heat, stirring to dissolve the sugar. Add the lemongrass (if using), turn up the heat for 10 minutes and reduce the juice by half. Set aside several cherries to decorate, then halve and stone those remaining. Add the halved cherries to the juice pan and simmer for 2 minutes then turn off the heat and leave to cool. 6. To serve, whip the double cream and spoon over the pavlova. Top with the cherry syrup and whole cherries. Draw a circle on the underside of the parchment as a guide for the pavlova (a cake tin works well). You can add 1-2 tbsp of kirsch or rum to the cherries as they cool, if so desired.